Ali and Sara are both doctors and they met while working with a their professor one summer. Sara also has an amazing singing voice and has sung opera at world famous venues. Their wedding was a beautiful ode to both Ali and Sara's cultures and traditions.Their church ceremony took place at the stunning Wayfare Chapel in Palos Verdes, which was followed by the reception at Trump National Golf Club. 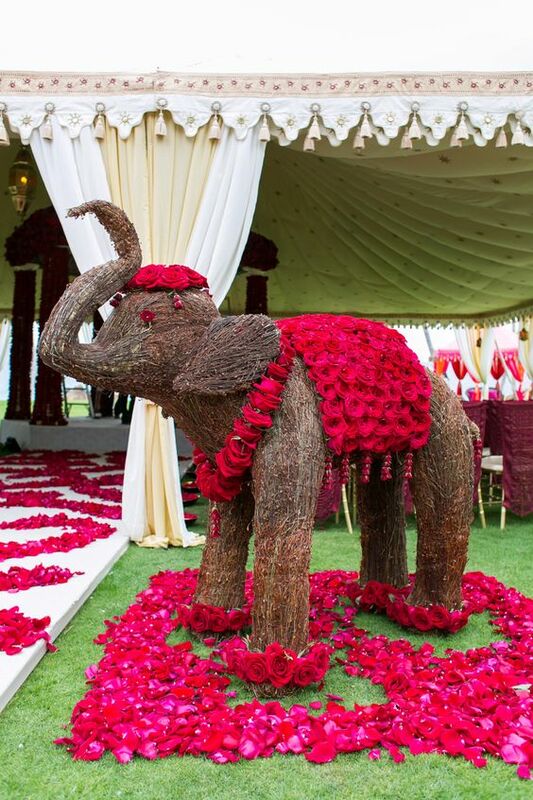 The Mehndi was hosted by Ali's family and Exquisite Events created a beautiful, colorful, exotic, and ethnic ambiance. Sara even learned to dance to a Bollywood song and wowed the guests! [caption id="attachment_6626" align="aligncenter" width="605"] Indian Bride photographed by Joey Ikimoto at Westlake Four Seasons[/caption] The grand finale was at the Four Seasons Hotel in Westlake Village with an outdoor ceremony. 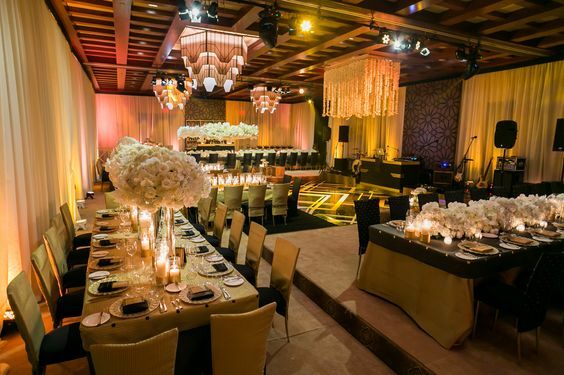 Sara also wanted deep purples and aubergines inside the ballroom with gold accents. 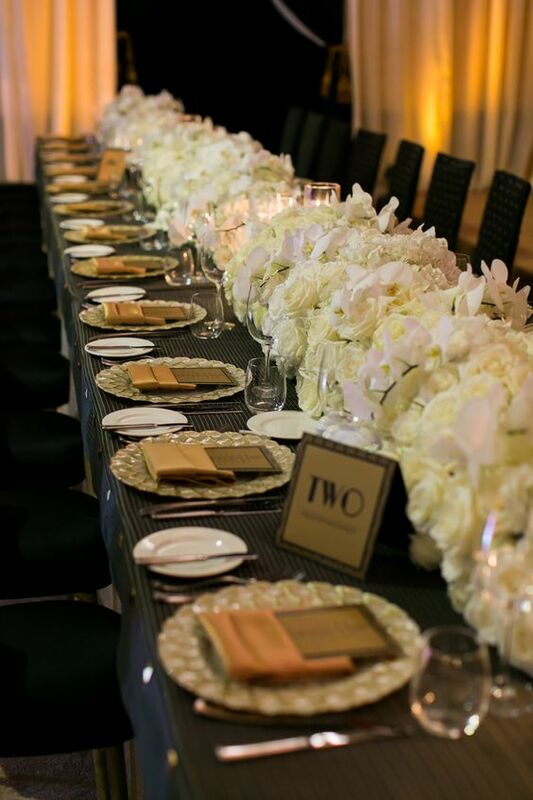 The room was draped in rich purple and stunning Wildflower Linens adorned the tables. 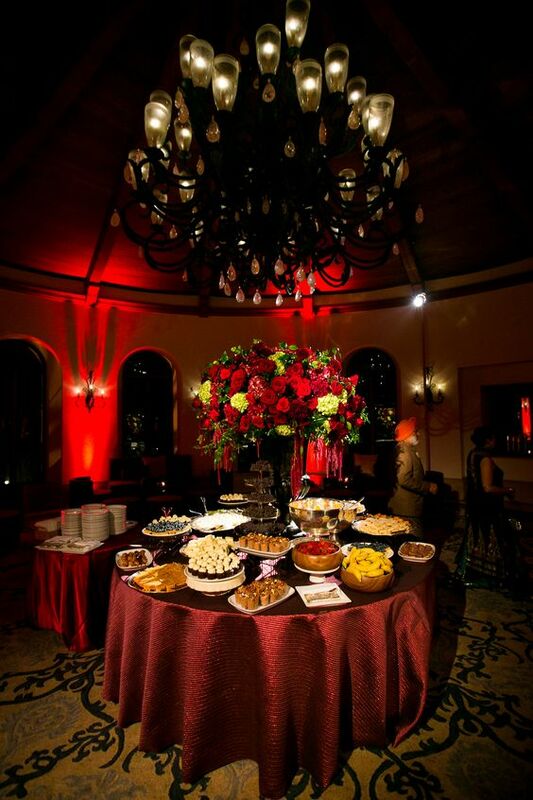 Hidden Garden created gorgeous centerpieces in deep reds and purples with gold accents. Tons of candles sat atop the tables. Rosebud Cakes outdid themselves with a phenomenal gold and white cake. 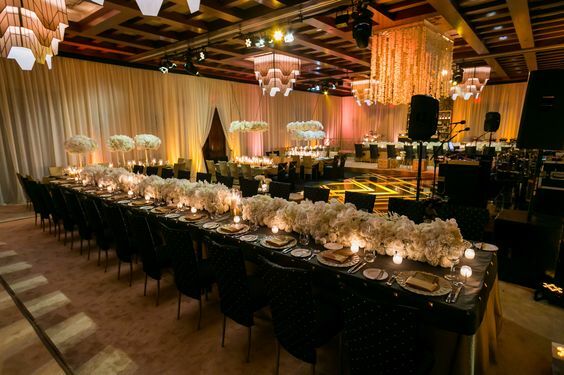 As the ballroom doors openend and guests made their way to their seats, ballroom dancers waltzed around the dancefloor to Elan's enchanting music. The couple made their grand entrance accompanied by the ballroom dancers to the dance floor where they did an elegant waltz. The band continued to play amazing tunes and songs in between each course and guests enjoyed dancing. The evening lasted until midnight and the event was a huge success. Thank you to all of our wonderful vendors! Venue: Four Seasons Westlake Village Planner, Designer, Coordinator: Exquisite Events Cake: Rosebud Cakes Linens: Wildflower Linen Band: Elan Photographer: Joey Ikimoto Florist: Hidden Garden Draping and Rentals: Luna Rentals Lighting: Ambiance AV Photo credits: Joey Ikimoto See you next Wednesday and have an Exquisite Day! This event took place in January, 2014 at Calamigos Ranch in Malibu. The bride and groom met in school during their residency and shared a similar vision about their wedding ceremony which took place at the Cottage under the large oak tree. They both wanted something organic and simple and with yellow and orange colors. Nikki decided to build a stage on the raised surface and hung marigold garlands from the tree and covered birch branches with marigold flowers. The groom arrived amidst the sound of dhol and music on the horse on the long walk way which was covered with red carpet runner. The greeting of the families took place by the fountain where the bride's family awaited groom's family with marigold garlands. 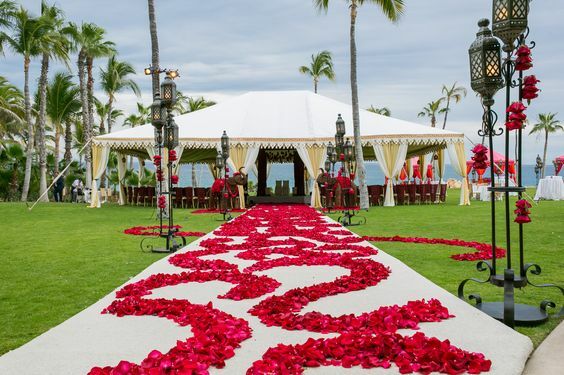 Guests were led to the ceremony site under a floral arch. Bridesmaids were wearing navy blue attire matching the ceremony programs. The ceremony lasted for about an hour and was absolutely beautiful. Guests were then escorted to the Pavilion Lawn for cocktails which was set up with lounge vignettes, beautiful bars and cocktail tables where they sipped cocktails and enjoyed tray passed hors deovers amidst the sounds of live Indian band. 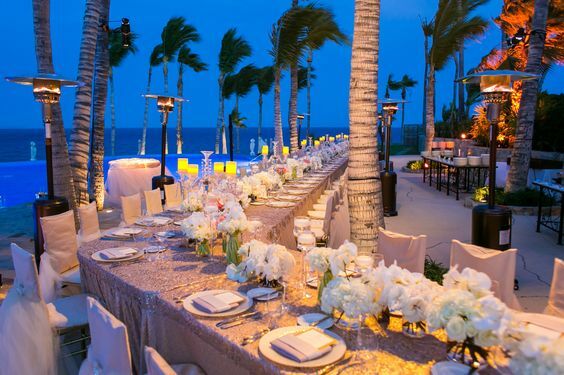 For the reception, two large tent structures were created; one for food and one for guests. 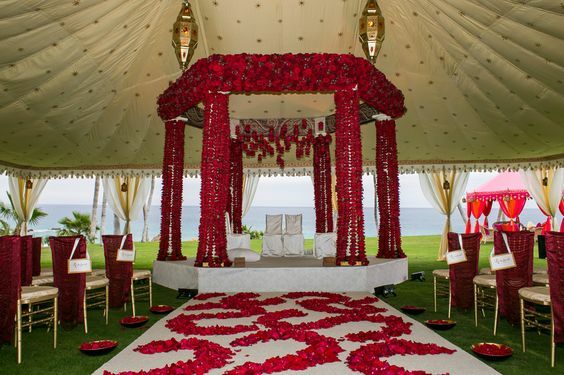 The Regal tent from Raj Tents in deep blue and deep red flowers looked majestic and royal. Every single element of the table decor came from an outside vendor from chargers, flat ware, stem ware to china etc. Couple had created love notes that they wrote to each other that sat atop tables. Dancing took place inside the pavilion tent on the beautiful bronze dance floor bearing couple's initials. The food tent was in champagne and gold colors and there were several food stations including brazilain bbq, tacos, chinese, continental and several more. The couple made their grand entrance amongst thunderous applause and went to the smaller dance floor that was created specifically for their first dance, the father/daughter and mother/son dance. They started with slow dance and then the groom just got down and did the most amazing dance moves and the bride kept up with him. Needless to say guests were thoroughly entertained. After cake cutting and a welcome toast, guests were escorted to the food tent and after that it was a big party all night long. The couple made their exit in a decorated Bentley amidst sparklers ( in this case two hundred lit candles ) and the evening came to an end. The groom is currently doing his fellowship at Cedars Sinai and the bride is at UCLA. Pavni + Manu // Built to Love You / Same Day Edit from RainbowFish on Vimeo. See you next Wednesday and have an Exquisite Day! Happy Valentine's Day Exquisite Events fans! This week's blog is for the lovers. The following are Nikki and Madiha's favorite restaurants in Los Angeles for a romantic Valentine's Day date. Get on it lovebirds! Make those reservations! This week, I had the pleasure of getting a little closer look into Exquisite Events. I wanted to know a little more about Nikki and Madiha and their day-to-day work and social lives. The following is just a little slice of my interviews with Nikki and Madiha. It's Saturday morning and I call Nikki for a short interview. I can hear 2-year-old grandson, Zayn in the background, asking Grandma if it's okay to climb on this or that. She gently tells him "no, baby" and explains to me "this kid entertains me to no end," as she returns her attention to our call. Rebecca: What is a typical day in the life of Nikki Khan? Nikki: No typical day - starting work at 9am in my home office, I'm on the computer and phone straight for 7-8 hours with a short break for lunch or if I have appointments, I am usually out the door by 8:00 a.m. Either way, all day I am on the phone, working on timelines, and fine-tuning events. [caption id="attachment_6548" align="aligncenter" width="605"] Nikki's Home Office[/caption] R: What about a non-work day? N: During not so busy times... what do I do when I'm not busy?? My joy is to spend with my grandchildren. Last week I had my son's three kids over and today I have my daughter's son over. It's always the happiest time for me. R: How about you, Madiha? Madiha: Well I wake up around 7 am by my 2 year old son, Zayn who is now my alarm clock. The first thing I do is read news headlines on my phone and then go through social media. Feed my son breakfast, and feed myself (when I remember) and then I either hit the computer or am out the door for meetings. [caption id="" align="aligncenter" width="605"] Madiha and Zayn[/caption] R: Were you always interested in events? M: I wouldn't say that I have always been interested in events. I have always been around them because my parents used to host a lot of parties when we were younger and we would always help out. Of course when you are a kid you dont really appreciate things until you get older. I would say when I went to college is when I really started getting into the wedding and event world. N: I was raised around events. Coming from a large family, there was always something going on - weddings, engagement parties, etc. 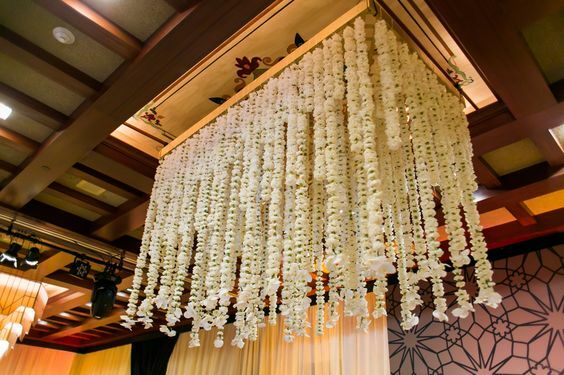 I was always an active part in that and enjoyed participating in the setup and decor. R: What got you started doing events professionally?